The location was in a corridor in a fine hotel in Washington DC. The "Take It!" came from my taking pause to really look at a setting that I had seen many times before. It was early enough that there were no other people in this usually busy corridor. What I saw was the effect of the overhead lights upon the setting. First was the light upon the ceiling thus illuminating the stretch of hallway as was the intent. Next came the circular patterns formed by shadows in the carpet below from the lights. Last but not least were the reflections from the lights in the marble approaching the carpeted area which in a way formed a welcome to this friendly setting. The After Take: To those I showed this to, the reaction seemed to be a calm that came from this unexpected stretch of muted but effective lighting found in such an unexpected place. It was one of those short lingers, but definitely a cool find. Here is hoping you too happen upon an atmosphere that has just the right feeling about it. Great looking hotel. I'd definitely fork over the cash to stay there. I just keep thinking Tom Cruise is gonna slide out like he did in Risky Business. Cool shot. So clean you could eat off it. 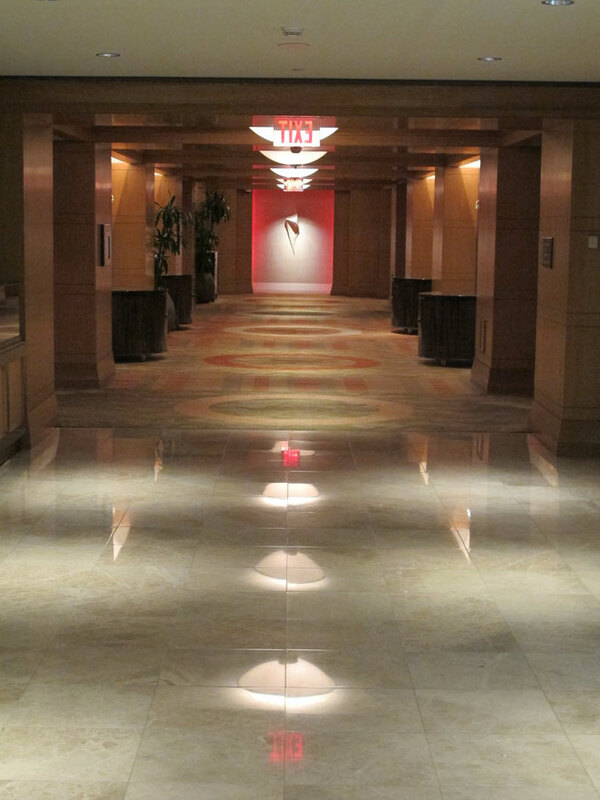 I bet the reflection adds a bit more light to the actual hallway. Its floors like these that required me to yell NO RUNNING to my kids when they were younger. A friend of mine that frequents this site, recommended it to me. Browsed through about half the summer shots and read a few of them. Cool website. I will have to go back and check some more of these out as time permits.